Long-range ballistic missiles entered American military service during the late 1950s. They are called ballistic because, like the shell from a gun, they receive a brief but powerful initial impetus (from a rocket motor), then follow an unpowered ballistic trajectory after launching. Polaris was the first U.S. Navy ballistic missile systema nuclear-powered submarine with 16 guided missiles, each armed with a nuclear warhead many times more powerful than those used in World War II. The first model of the missile, Polaris A-1, went to sea in late 1960. Polaris A-2 became operational in 1962, A-3 in 1964. The Poseidon missile succeeded Polaris beginning in 1972, followed by Trident I in 1979, and Trident II in 1990. Each step brought major advances in warheads and accuracy. 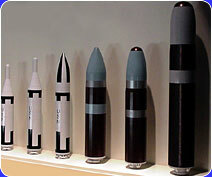 Scale models show the relative size of the six types of U.S. SLBM: Polaris A-1 (1960), Polaris A-2 (1962), Polaris A-3 (1964), Poseidon C-3 (1972), Trident I C-4 (1979), and Trident II D-5 (1990). All six missiles used solid fuel in multiple stages: two stages for Polaris and Poseidon, three for Trident. All versions of Polaris had a diameter of 4.5 feet (1.3 m), but they grew longer28 to 31 to 32 feet (8.5 to 9.5 to 9.8 m)and heavier14 to 16 to 18 tons. They also increased in range1,200 to 1,500 to 2,500 nautical miles (2,200 to 2,700 to 4,600 km)and accuracy. Polaris A-3 missiles carried multiple warheads, or MRV (for multiple reentry vehicle, the protective covering that keeps the warhead from burning up during atmospheric reentry). 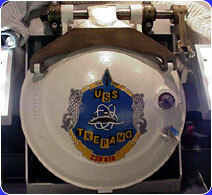 Through this small hatch from the USS Trepang (SSN-674), sailors eased the skid-mounted 3,000-pound (1,360-kg) torpedo down into the submarine.